Gibson, William, and Bruce Sterling. The Difference Engine . Bantam/Spectra 1992. Gibson, William, and Bruce Sterling. The Difference Engine . 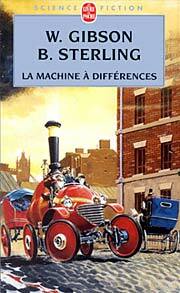 Translated to the French as La machine à différences , Livre de Poche 2001. What if: Byron led the Industrial Radicals to English power, and Babbage perfected his analytical engine so that the Information Age began a century early. Summary: A paleontologist accidentally acquires a set of punch cards from Ada Byron, dropping him right in the middle of a circle of mayhem and murder. Comments: A definition and explanation of many terms may be found in Eileen Gunn's "The Difference Dictionary, q.v. 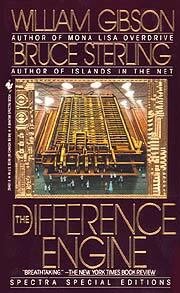 Also, the novel has been described as a cyberpunk/steampunk rewrite of Benjamin Disraeli's 1845 novel Sybil, or The Two Nations , as many of the same characters appear in both. Published: Gollancz 1990 (0575047623), 1991 (057505297X), 2011 (0575099402BUY); Bantam/Spectra 1991 (0553070282BUY, 057505073XBUY), 1992 (055329461XBUY), 2011 (0440423627BUY); BOMC 1991; BOMC/QPBC 1992; and Gollancz/Vista 1996 (0575600292BUY). Translation: Czech by Pavel Dolezal as Masina zazraku , Navrat 1999. Translation: Nederlands by Peter Cuijper as De stoomvlinder , Meulenhoff 1992 (9029041641). Translation: French by Bernard Sigaud as La machine à différences , Laffont 1996 (2221082494), Livre de Poche 2001 (2253072311). Translation: German by Walter Brumm as Die Differenzmaschine , Heyne 1991 (345305380X). Translation: Italian as Machina diferentiala , [[publ. unknown]]. Translation: Italian by Delio Zinoni as La macchina della realtà , Mondadori 1992 (8804360410), 1995. Translation: Japanese as [[title unknown]] , [[publ. unknown]]. Translation: Polish by Piotr W. Cholewa as Maszyna roznicowa , MAG 1997 (83865725253). Translation: Portuguese by Ludmila Hashimoto as A Máquina Diferencial , Aleph 2012, 2015. Translation: Romanian by Gabriel Stoian as Machina diferentiala , [[pubk. unknown]] 1999. Translation: Russian as Mashchina Razlichiy , [[publ. unknown]]. Translation: Spanish as La máquina diferencial , La Factoría de Ideas [[year unknown]] (8498002818). Awards: Nominee: 1991 Nebula for best novel. Nominee: 1992 John W. Campbell Memorial Award.